Matt was the very first online friend that I had ever made. I met him by chance while collecting Mattels M.U.S.C.L.E. figures in 2000. We would later find out that we had a lot more in common than collecting those little guys, especially music. 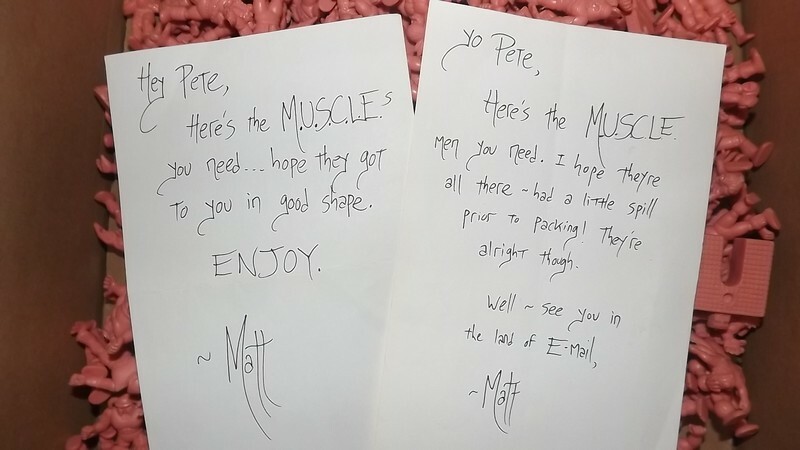 A couple of letters Matt sent me with lots of Mattel's M.U.S.C.L.E. figures that I needed to complete my set. I saved them because I thought Matt's hand writing was neat-o. I don't think I've ever had more fun collecting anything and a lot of that had to do with Matt. Matt had the ability to master any instrument that he could get his hands on. He was a real renaissance man in that respect. He produced music ranging from Metal to Ethereal and would always contribute something unique to whatever he worked on. His band Twelfth Of Never became a favorite of mine. An early picture of Twelfth Of Never taken by Babble. Pictured from left to right: Matthew Davis, Ron Miles, Robin Tinker, and Keith Landry. I have a framed print of it I made back in the early 00's next to my stereo. 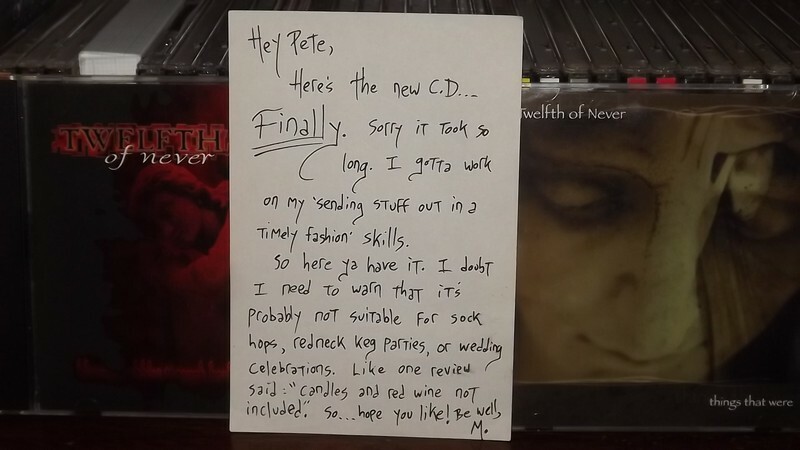 My hard copies of Twelfth Of Never's first album, Blowing Bubbles Through Broken Windows and their second one, Things That Were, along with the letter Matt sent me with it. My friendship with Matt and another online friend of ours named Chris was one of the inspirations for my RPG series: The Weapons of Ganildan. The characters Mathyou and Chris were based on them with the character Peter being based on myself and so on. Our chance meeting was one of the games many inside jokes. Matt and Chris encouraged me to make my RPG public after playing the first chapter. Their continued support, as well as fans of the games led to two more chapters being made for the series before it was released as one big game in 2007. 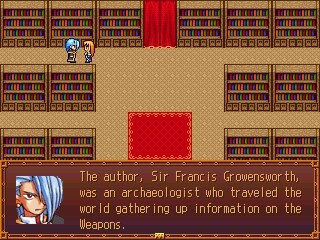 A screenshot from my RPG: The Weapons of Ganildan, the character Mathyou talking to Peter. There's a link to the game's website at the bottom of the page. Just click on "Back". Matt and I corresponded with each other via email and Instant Messenger for most of the 00s. Many good times were had. We would fall out of contact after life had grabbed us by the wrists one day and had pulled each of us our own separate way. Matt became a parent and I became a care giver for my father and then grandmother and briefly for my mother. All of which have passed on. I would find out years later that Matt, too, had passed on. With the exception of my grandmother who was blessed to live to the age of ninety-seven, I felt that all of them had passed too soon. Matt was only thirty-seven when he left this world. I enjoyed my friendship with Matt and I wont forget him. He was a very talented guy who I had a great deal in common with.